This weekend’s run of gigs was quite excellent. We hit The Stone Church in Newmarket, NH for the first time on 10.1.09. Our set went really well, and it was a good feeling to be playing in such a cool room. We have been playing some of the same new songs consistently in our sets, lately. A few of them are called ATM Tune, Rode, Derek Does Ohio, The Donkey Kong Collaboration and another one called I Know U Know. We might change the name of that last one. Anyway, we are planning on putting these songs, along with some others, out in studio form in the coming months. We are looking forward to the whole process. Our collective style has been really coming together in recent months, and we have all felt that added swagger on stage as a result. Show note: we played this show with an act out of NYC called Stratospheerius. They were insanely good musicians and did a version of Magic Fingers by Frank Zappa during their set. It was excellent. Well done, guys! Friday night, 10.2.09, we returned inside at Cap'n Carlos in Gloucester, MA. The stage was a little tight, but as a result I think we played some of our tightest sets in recent history… yes…pun; ) At this type of gig, it is wise to pepper the sets with a few more covers. There was a wedding party there, and some other folks who don’t know us that would have likely beat us if we didn’t play something they knew. Anyway, by early 2nd set everyone was getting down to our songs right along with the Bill Withers tune. Not a bad night at all. I thought this might have been the best quality we played all weekend. 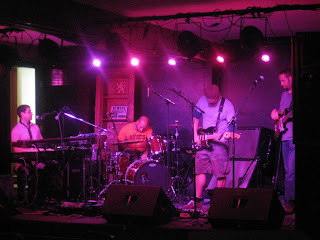 The final gig of the run was up in Portland, ME at Brian Boru in the Old Port on 10.3.09. Some old friends were in the house for this one. Everything felt good on stage. Gig note: they stopped the house music halfway through Billie Jean… which left us with a totally deflated room of drinkers looking at us in silence like we just ruined their science fair project. Being the on-our-toes kind of quartet that we are, we jumped right into our own little rendition of Billie Jean, and quickly won the cougar-filled crowd over. It was all good from there on out. We crashed at a dumpy hotel that night. I guess it was a blessing in disguise, though. We all got up early, and there was an extra sense of urgency in getting out of there. We cruised back to the Commonwealth, and were home in time for the Pats kickoff at 1pm on Sunday... and they won! YAY. The great article assited me a lot! Bookmarked your site, very excellent topics just about everywhere that I read here! I appreciate the information, thank you. A very good blog of various systematic criteria that we clarify doubts over life!Your so cool! I dont suppose Ive learn something like this before. So good to find any individual with some authentic thoughts on this subject. I found your blog useful. This is an extremely well written article. I will make sure to bookmark it and return to learn extra of your useful info. Thanks for the post. I’ll definitely comeback. Cool and very nice stuff and blog. You've got it all. Two thumbs up! Great post, well appreciated.I am happy that more and more people realize the importance and benefits of SEO. Search engine optimization can deliver long term results. I was reading and glance some of your articles, and I really love your idea of blogging. Very brilliant information, and it’s very helpful specially about your articles. I need this for sure! Thanks a Lot, I appreciate your ideas! Such interesting read and information, thanks for sharing this post, I’ve already bookmarked your blog. I can see that you are putting a lot of time and effort into your blog and detailed articles! I am deeply in love with every single piece of information you post here. Will be back often to read more updates. to get something new. I was not upset. Your ideas on new solutions on this topic were informative and a great help to me personally. Thank you for creating time to write down these things as well as for sharing your mind. Great weblog here! Also your website a lot up very fast! What web host are you the usage of? Can I get your associate link on your host? Feels great to come along with a site that offers much specifics of any common subject just like that which you are covering. Many of the information are proven with evidences that it made me easy to relate many of my works, as well. I suppose you have already helped a lot of individuals of the same need. So glad to come along with a site that offers much specifics of any common subject just like that which you are covering. Appreciate posting, keep up the nice work! Thanks for the share. This is quite interesting. nice post,it's help me a lot.thank you! It is a great inspiring article.I'm just pleased about your good work. You set really extremely helpful information. Hoping to reading the following post. Thanks! Pretty section of content. I just stumbled upon your website and in accession capital to assert that I get in fact enjoyed account your blogging site posts. Anyway I’ll be subscribing to your feeds and even I achievement you access consistently fast.